The are many types of grasses in our lake but these three are the most common as well as most productive. If you know your way around a grass lake this should be nothing new to you. However, if you are new to lakes with grass this page is for you. 1. The above picture shows the first of the exotic grasses to show up in Guntersville some 30 or more years ago. It tends to grow the shallowest of all three mentioned, growing in 7 foot or less in most cases. It can be identified by how soft it is to the touch. Similar to wet hair. 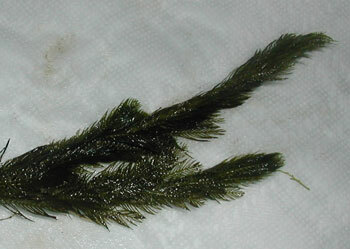 The tiny hairs or branches, if you will, go limp when out of water. 2. Above we have Coontail. It looks very similar to Milfoil but do not let the looks fool you, first of all it is usually much greener, sometimes almost florescent green. Also, it is very rough to the touch and does not go limp when out of water. The tiny hairs feel very prickly. It does not have roots so it can be found almost anywhere usually clinging to other grass types. 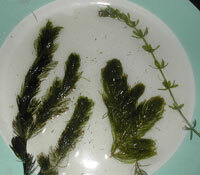 Coontail, in contrast to Milfoil and Hydrilla, is the most uncommon and prefers colder weather. It tends to be seen most often in late summer. After winter hits and the North wind has blown all visible grass away, it can still be found clinging to drop-offs and stumps as deep as 20 foot. 3. It grows the fastest and is by far the dominate grass. If you see it mixed in with Milfoil you can bet in a few weeks it will have taken over. Growing like crazy during the past number of years it has taken over almost all of the Milfoil areas. While it does hold fish very well, it can be intimidating being so wide spread. At first it was dotted along the river channel only mixed in with the milfoil. However, over the last couple of years it has dominated the river and is working on dominating the creeks as well. 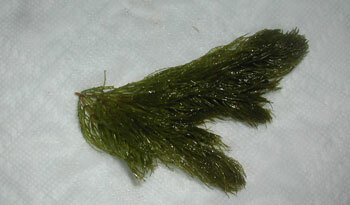 I for one prefer fishing milfoil over hydrilla but when hydrilla is the main grass the bass jump right in, and so do I.